If there’s one thing our industry loves it’s false dichotomies. Should designers learn to code or focus on design? Should they generalize or specialize in one area? These debates distract us from the real issue: it doesn’t matter how you realize your work, as long as the end result is a clear articulation of your design vision. Specific skill sets are merely a means to an end. Take a carpenter. Sometimes they’ll need to use to use a fine-toothed Japanese saw. Other times they’ll need a heavy-duty chainsaw. Part of being a successful carpenter is selecting the right tool for the job. The same is true of product design – you need different skills at different times. You need a blend of specialism and generalism, and at different points of your career. As I’ve helped build the design team at Intercom, I’ve found that both generalists and specialists are essential to a modern product design team. But their value is required at different points in a company’s lifespan. When a company only has a handful of designers, they must by necessity do everything. That means running the full gamut – from thinking at a product level, to interaction design, to high fidelity visual design and more. So what does a generalist need to know? The precise skills required (the technologies you use, the languages you can speak) are less important than the ability to think all the way up the stack of a product. A lot of startups might refer to this person as a “unicorn designer”. This is a misnomer. Unicorns don’t actually exist; generalists do. It is entirely reasonable to expect a smart, talented designer to equip themselves with the knowledge and skills needed to think holistically across all levels of a product. In your early days, having naturally curious designers, who can’t help but soak up everything around them, is table stakes. Curiosity is the single most important attribute in early-stage design teams. Without it, you’re limited by the knowledge and skills your designers carry with them. But designers who possess an insatiable curiosity will learn, adapt, upskill, and push your team forward in ways you could never predict. When something new is required of them, their immediate reaction will be to go and read about the subject. Not because it’s their job; because they simply can’t help being so damn interested in every aspect of design. These generalists are the glue that holds your startup together. They know enough about a range of broad disciplines, can import ideas and influences for a variety of sources, and know enough to collaborate with everyone in their team. So if everyone knows how to cook, why bother having chefs? For most companies, you’ll eventually reach the point where having someone who knows enough really isn’t enough. As teams scale, it becomes necessary to add people who are true masters of their craft. People who devote themselves completely to expertise in their chosen area. These are the motion designers who have studied animation, the prototypers who design by making, and the visual designers who have a deep obsession with grids, color theory, and Gestalt principles. Specialists are all about magnifying advantages. They can dig deep into the entire range of local solutions. They bring a degree of experience and domain knowledge that a generalist never could. They can apply a level of polish and professionalism to their niche of the product that their generalist colleagues could never achieve. They can coach and advise other designers in their area of expertise. It’s like adding rocket fuel to your team – they make all output along one specific dimension immeasurably better. 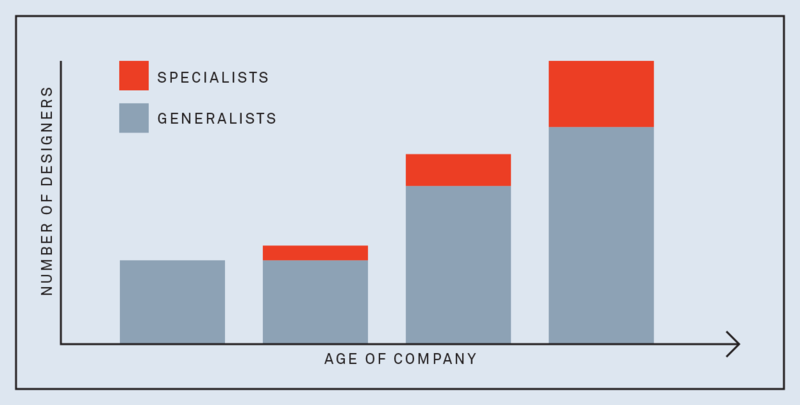 So should your startup hire specialists or generalists? The type of designers you should hire really depends on what stage your company is at. At an early stage startup, you should hire a bunch of generalists. As your team matures, as you encounter the murkier corners of your problem domain, start blending in specialists. There’s no one size fits all ratio for product design teams. At Intercom we aim for a rough ratio of 5:1 for generalists to specialists. It means we have broad enough skills to be able to ship quality product, but narrow enough to raise the bar in the places that really matter. However you fall down in the specialist vs generalist divide, remember that the roles of individuals are secondary; what matters is the completeness of the skill set to help you fulfill your product vision. Hire anyone who can help you realize that, because it takes all sorts to truly achieve it.